We all know what happened to Caesar, but what if you had a chance to change the history? Hide him from the rockfall by placing different items for his protection. 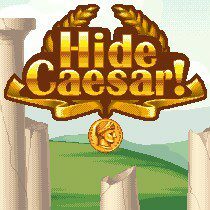 Hide Caesar and save his life! Don't let the traitors catch him and do their job. You have not that much time left. Use everything you find useful and cover him before the rockfall starts. Make sure no stone will touch the ancient leader and proceed to the next level. Each following level is far more complicated, so turn your brain on!